Almost Everything You Wanted to Know About 3D Scanning from Direct Dimensions, Inc.
Every year, we meet many people who think what we do is interesting, but aren't quite sure how our 3D scanning technologies can help them. We're sure that if you clicked on the link to read this article, you might be one of those people. Don’t worry, Direct Dimensions is here to help -- our easy to follow primer on 3D scanning will help you discover the ways our cutting-edge technologies can help you and/or your company. In the same market space as the V Flash, Solido bills their SolidPro300 as the “world's most cost efficient and flexible 3D printer”. In the US the SolidPro300 is distributed by Enser. If you have any questions feel free to contact us at info@dirdim.com. Stay tuned to our Newsletter each month. Next month we are introducing a new feature called “Ask the Expert.” You can submit questions about the 3D scanning and modeling process, or even how to deal with a specific problem you may be having to sebright@dirdim.com. Up to now we’ve been discussing putting physical objects into the realm of the digital, but before we finish this series we need to talk about another common application for our 3D scanning and modeling processes. Chapter Nine focuses on creating physical objects from digital data. Additive Manufacturing – the process of making a physical object from 3D digital data by layering materials; also known as rapid prototyping and 3D printing. Milling – a subtractive process of removing material to create a physical object directly from 3D digital data by the cutting away from existing solid material. Scaling: Making enlargements, reductions, or even exact size replicas...we can do it all. After a Digital Model has been created, there are few boundaries as to how big or how small we can replicate your object or part. Restoration: Our technology enables us to capture accurate 3D data that can be used for manufacturing to completely restore any object that has been damaged by weather, neglect, natural disasters, etc. such as historical monuments and artifacts or aged aircraft and automotive parts. 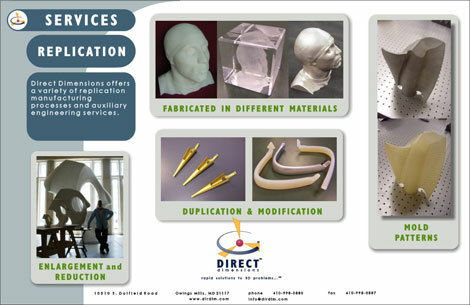 Manufacturing Prototype: With a digital model, Direct Dimensions can create a physical prototype that can be used for testing or to manufacture final pieces, such as milling a foam sculpture for a bronze casting pattern or creating a finished prototype as a concept model for a new consumer product. And now we can talk about the best ways to create the physical models. There are a variety of additive manufacturing equipment manufacturers and processes on the market. Regardless of the type of AM, the various machines read the 3D data most typically in an STL file format. We discussed this format in earlier editions. The software within the machines then generates the layering instructions and directs the deposition of successive layers of material needed to build up the physical part. Essentially this part is created from cross sectional layers. The layers are fused together automatically and ultimately create the final shape, an exact physical replica of the 3D model. Additive manufacturing is an umbrella term that covers many of the following processes. One of the earliest and most common types of AM is called Stereolithography (also known as SLA). SLA builds pieces using a laser and a vat of UV-curable liquid resin. Each thin layer of resin is solidified and secured to the layer below with every pass of the UV laser. SLA is good for producing models, patterns, and prototypes. A downside to SLA is that it generally requires support structures to be included in the build, which is part of the SLA process. Another AM process is Selective Laser Sintering (also known as SLS). Unlike SLA, SLS can utilize a wide variety of materials such as plastics, metals, and ceramics although post processing may be required. SLS does not require support material while building since it is built and incased within the raw material. SLS uses these materials in a powder format and, by fusing the powder together, creates the layers needed to build the part. SLS is increasingly being used to create final parts for when mass scale production isn’t necessary. Similar to Stereolithography is Fused Deposition Modeling (also known as FDM). FDM, trademarked and marketed by Stratasys, also uses the additive platform build concept. Rather than raw liquid or powder, FDM uses thermoplastic materials which are applied through a heated nozzle that places a single thermoplastic bead at a time. These beads fuse together and harden as cooled. The plastics used in FDM are known for their strength and high heat resistance, making them good for product testing. 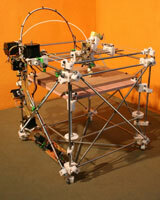 Perhaps the most similar to regular 2D printing is the concept of 3D Inkjet Printing. The only rapid prototyping technique that can print in multiple colors, 3D printing also uses a powder base material, but rather than sintering the powder, an inkjet releases a dot of adhesive mixed with coloring, allowing the layers to be built with colors. While the final model is not generally as strong as the other three techniques it is usually cheaper and faster and the colored prints allow for good representation of final concepts. Recently 3D printing has been used commercially to create personalized figurines from World of Warcraft and Rock Band avatar characters. The primary advantage to additive fabrication is its ability to create almost any shape or geometric feature relatively quickly and inexpensively. We generally say that for a small part, you can’t beat the price to complexity ratio. 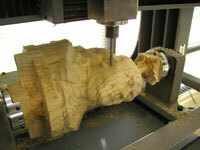 However the overall volume within a single build is generally limited for AM and for larger parts we recommend milling. Milling steel or aluminum is a common option to make durable tooling. And stone and wood are common for sculpture and historical restoration projects. We are almost done with our “Almost Everything You Always Wanted to Know About 3D Scanning” series. Don’t be surprised if we add additional chapters now and then; the field is constantly changing and growing. We wrap up this series next month talking about the immediate future of these technologies, including desktop (or home) scanning and manufacturing. Stay tuned for next month’s newsletter or click here to read previous chapters. When most people think of computer animation they think of the neat special effects in blockbuster movies and the animated explanations of complex events on the nightly news, such as train accidents. Yes - 3D models are frequently used for those types of animations. But often these animations are pure visualizations where the dimensional accuracy of the objects is less important – as long as it looks good. 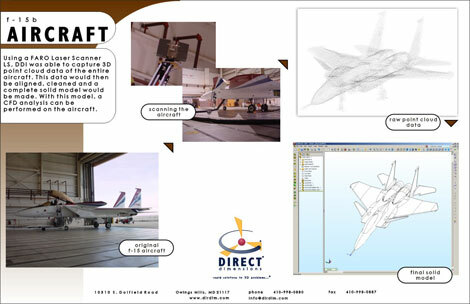 A Direct 3Dview is a fully-interactive real-time 3D presentation of a digital model in a virtual environment. This 3D model visualization can be displayed via a website, a PowerPoint, or even in a stand-alone format. The Direct 3Dview of your object can be used to create an on-line 3D catalog to allow web visitors to fully experience the product - virtually. Another great application is for 3D proofs of concept for a new design or invention in a collaborative viewing environment. ShapeShot™ - New Applications Daily! STEP – "Standard for the Exchange of Product model data," (ISO 10303) an advanced neutral format for exchanging CAD data between many different software programs. The above examples are just a small taste when it comes to the “flavors” of CAD, but they are the most common files used. Hopefully this little list has helped a bit. If you have any questions you should just ask your 3D service provider and they will be happy to help. You can always ask us questions at info@dirdim.com. Stay tuned to our Newsletter each month for more chapters. If you can’t wait until next month, then feel free to visit our Learn More Page. We’ve reached the fun part! What can you do with a 3D model? Practically anything! In a world that is increasingly digital, most industries now utilize 3D files in some fashion. We’re seeing them show up in many different places lately. At this point in the process, you have your 3D model from your scanned original part. It has been either digitally modeled into a polygon format or reverse engineered into a CAD format, according to your needs. But, you can do so many things with your 3D data – things you might not have even thought of yet! Chapter Six covers the different downstream applications for 3D data file. After your part or object has been laser scanned and modeled you now have a digital "backup" of the object. Scan data for archival purposes is useful for a number of industries: Aerospace/Defense, Consumer Products/Industrial Design, Architecture/Historic preservation and Museum/Fine Art. 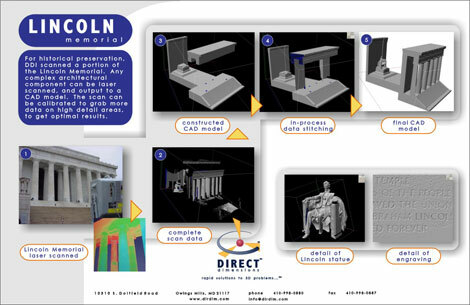 At Direct Dimensions we’ve scanned many objects specifically for the purpose of creating a digital document. Archival scans have ranged from the Lincoln Memorial (post-9/11) to a huge rare meteorite to legacy aircraft parts that are no longer made. This application definitely falls into the realm of advertising and entertainment but also museum presentations, legal cases, and even high quality training simulations are also all great uses for 3D model visualizations and animations. Direct 3Dview of your object – can be used to create an on-line 3D catalog or proof of concept. FaceScan – scanning a person for animations, avatars, mass personalization of consumer products, or even simulation programs. Animation – recent scans of people, objects, and structures have been used to create commercials, films, music videos, and video games. Rendering – high quality 2D renderings using 3D models can be used for marketing purposes. Renderings of structures and viewpoints have also been used in legal cases to prove/disprove eyewitness accounts. Same 3D Data, Many Different Uses: Repurpose! A consumer products company has an object scanned so that it can be prototyped. What they might not know is that with a little tweaking of the model they can also gather the measurements needed to create perfectly fitting packaging and also creating photorealistic models for subsequent advertising or a virtual catalogue. An aerospace company has a cockpit scanned for human factors analysis. If enough data was initially collected, that same data could be used to help create training simulations. A major museum has a sculpture in its collection that is rapidly deteriorating and they want to scan it for documentation. That data could be used to create high quality mini replications to be sold in the gift shop or for research (possibly comparing it to similar castings by the same artist). The above examples are just a drop in the bucket when it comes to uses for 3D models. If you have a possible application that you think a 3D model would work for, you should just ask your 3D service provider if it can or has been done. If they are anything like us, they will either have already done it (or tried it) or be so intrigued by your application that they are willing to give it a shot! And if you can’t do it yet, check back often; new applications and methods are being invented every day. The world of 3D imaging, modeling, and engineering continues to grow at such an incredible rate that older applications are always being improved upon and new ones are always being dreamed up. We are almost ready to move on to downstream applications for 3D models, but before we jump into that, we need to talk about one more application for scan data. Chapter Five will cover how this data can be utilized for quality inspection. CMM - Coordinate Measuring Machine, a mechanical device that obtains 3D coordinates by probing, may be either touch probe based or non-contact, portable or stationary, or motorized or manual. Laser Tracker - sends a laser beam to locate a reflective target held against the object to be measured. The beam reflects back to the tracker and calculates the distance and angle of the targets location. Laser trackers are a great option when you need extreme accuracy over larger measurement ranges. Color Map - a graphical display for visualizing dimensional differences between the measured shape of an object and its nominal CAD model; deviations are mapped to a color spectrum indicating location and magnitude. A reference key maps the deviations to values. While we think of the 3D scanning industry as something very new, the first 3D digitizers, Coordinate Measuring Machines (CMMs), were actually built in the 1960’s and the entire purpose of this development was to perform dimensional inspections. Fifty years later, inspections are still one of the most common uses for 3D digitizing and scanning systems. In the late 1980s engineers at the then-Martin Marietta (including Direct Dimensions’ founder and president Michael Raphael) became aware of a company making articulating arms for medical measurements and they began working with the company (Faro Technologies) to develop a portable CMM for inspections in the aerospace industry. After the creation of the portable CMM, the options for 3D measurement and inspection exploded. Laser Scanners were added to the portable arms and then Laser Trackers were developed. Twenty-five years later, portable scan arms are common measurement solution in major manufacturing firms across the world and in industries ranging from aerospace to automotive and power generation to medical. 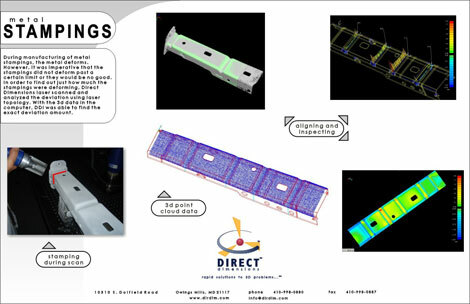 One of the fastest and most informative types of inspections is the Dimensional Deviation, CAD to Part Inspection. A typical process for a Scan Arm, the scan data is compared to the original CAD model in a software package which will then show deviations by a color map. A variation of the Dimensional Deviation is the Virtual Assembly Analysis. By using reference points, such as interface datums, we have the capability to, in a virtual environment, simulate and identify how parts will fit together in their real-world assembly. We can do this by using assembly characteristics of the part (such as weld points, slots, and holes) to apply the mating constraints during assembly. This is also known as a “reference point fit” which can discreetly control part movement in any axis of each control point. The analysis can show part collision or spacing in a real world scenario done virtual. Parts can also be measured while they are in the process of being machined, an On-Machine Inspection allows for important characteristics to be measured and changes to be made while the piece or tool is still being created. These are typically done with either a Portable CMM with probe and scanner, or a laser tracker depending on the size of the object being machined. Similar to on-machine inspections, are real time inspections for Installation Alignment. This is helpful for installations of major equipment and is typically done with a laser tracker, PCMM, or similar. Perhaps the most comprehensive of the inspections is the First Article Inspection (FAI) which involves a thorough point to point inspection of a physical part against the production drawing dimensions. This is a very typical process for a portable CMM. In the previous chapters, to get you going, we discussed the software products that we use literally every day here at Direct Dimensions. Below are the products that take the 3D measured data from the portable arms and scanners and perform the inspection analysis processes. Each of them has some capabilities to perform the two main types of inspection – discreet point dimensional inspection and dense point cloud comparison analysis. Some have more comprehensive capabilities that include GD&T or special case analyses; and some specialize in certain areas such as ease of use or multi-scanner integration more than others. At Direct Dimensions, we use all of these regularly and help our customer understand the strengths of each package relative to their specific application and company needs. If we are performing the project for someone as a service, they get the satisfaction of knowing we will use the best software for their inspection. Feel free to call us directly for more specifics on how these packages compare for your needs. Now what can I do with my model? Having learned what you can do with your data: inspect, reverse engineer or digitally model, we are now ready for the fun part! Chapter 6 will be an overview of the downstream applications for 3D models. The possibilities are numerous and we and our customers are thinking of new ideas every day. Reverse Engineering - the process of measuring and then creating a CAD model of an object that reflects how the object was originally designed (with its design intent). Design Intent - the intended design of an as-built physical object. Every manufactured part or object varies from its original intended design by some factor. These imperfections can be identified, analyzed, and corrected during the reverse engineering process. As-built - modeling which captures the exact physical shape of an object as it actually is, with its imperfections (as opposed to its design intent). The bridge between Digital Modeling and Reverse Engineering is the Hybrid Model (previously discussed in Chapter 3). A hybrid model is a polygonal model that has been converted in a rapid NURBS surface model and then also uses some traditional solid modeling techniques. It is commonly used when basic geometric features, such as holes & edges, blend with complex organic contours, such as a machined casting. You’ve read your overview, figured out how to collect data, and now that you have this data, what do you do with it? Chapters Three through Five will cover how this data can be processed. As you learned in Chapter Two, Direct Dimensions breaks data collection into two common methods: Laser Scanning and Digitizing. We also categorize the processing of the collected data into two main categories: Digital Modeling and Reverse Engineering. In this chapter, we’ll tell you what you need to know about Digital Modeling. Digital Modeling: the process of creating a computer model of an object that exactly replicates the form of the object. Laser scanners are used to capture the 3D data of the object, and this data is transferred to the computer where it is aligned, edited and finalized as a complete 3D model. So, when does something fall into the category of Digital Modeling as opposed to Reverse Engineering? At DDI it generally depends on a couple of factors: shape (organic vs. geometric) and desired file output. As a general rule of thumb, organic shapes tend to fall into the Digital Modeling category, as do polygonal models (STL Files) and Rapid NURBS Dumb Solids. A Rapid NURBS ‘Dumb’ Solid (usually in IGS format) starts with the polygonal model. NURBS surfaces are wrapped over the polygonal wire frame. This wrapped surface model is smoother than a polygonal model. The NURBS model can be brought into parametric modelers such as SolidWorks (albeit with no parametric history – which is why we call it dumb). The bridge between Digital Modeling and Reverse Engineering is the Hybrid Model. A Hybrid model is a polygonal model that has been converted in a rapid NURBS surface model and then also uses traditional solid modeling techniques. It is commonly used when basic geometric features, such as holes & edges, blend with complex organic contours, such as a machined casting. Do Reverse Engineering and Digital Modeling ever Overlap? 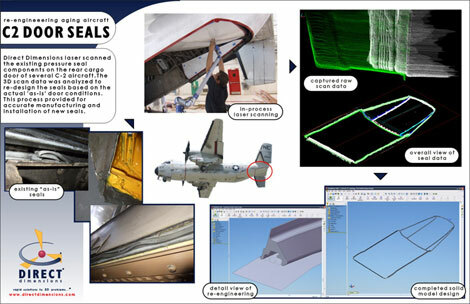 In addition to Hybrid Models, there are instances when it is appropriate to use both Digital Modeling and Reverse Engineering techniques. For example, when collecting data of a large object (such as a plane) for Reverse Engineering, it is necessary to use a laser scanner to capture the massive amounts of surface data. The data output from a laser scanner is a point cloud, but point clouds cannot be brought into any CAD packages. Before the data can be transferred into CAD it must be digitally modeled into either a polygonal model or a Rapid NURBS dumb solid. Digital Modeling generally offers a faster and more cost effective solution. It presents a great solution for creating solid models when an object has organic contours. Offers excellent dimensional accuracy and can be utilized for comparative analysis. While it is true that Rapid NURBS Dumb Solid models do not have parametric history, they can be utilized as a base for design work and Boolean functions are possible. Unlike raw point clouds, Digital Models can be visualized in rendering software as a solid object, which is great for seeing the overall shape and contour of the model. Geomagic Shape Studio: Polygonal and NURBS modeling and point cloud to CAD comparison. Geomagic can automatically generate an accurate digital model from any physical part. PolyWorks Modeler: Polygonal modeling and point cloud to CAD comparison. PolyWorks can process large point clouds over 100 million points and easily integrates with all standard digitizers and articulating arms. Rapidform: Third generation point processing software for creating native parametric "design-intent" CAD models directly from scan data. At Direct Dimensions we often use Rapidform in Hybrid Modeling but it also has a great Rapid NURBS function. Now that you know a bit more about what we call Digital Modeling and why it can be a great option, you are ready to tackle Reverse Engineering. So, what are the ways that 3D data can be collected? There are multiple ways to collect 3D data but two of the most common methods (and the two most frequently used by Direct Dimensions) are laser scanning and digitizing. During laser scanning, a laser line is passed over the surface of an object in order to record three-dimensional information. The surface data is captured by a camera sensor mounted in the laser scanner which records accurate dense 3D points in space, allowing for very accurate data without ever touching the object. Laser scanners can be broken down further into types such as laser line, patch, and spherical. The FARO ScanArm, the FARO LS, the Surphaser, Konica Minolta Vivid 9i and Range 7 are some examples of laser scanners that we often use at Direct Dimensions. The second major method is digitizing, which is a contact based form of 3D data collection. This is generally done by touching a probe to various points on the surface of the object to record 3D information. Using a point or ball probe allows the user to collect individual 3D data points of an object in space rather than large swathes of points at a time, like laser scanning. This method of data collection is generally more accurate for defining the geometric form of an object rather than organic freeform shapes. Digitizing is especially useful for industrial reverse engineering applications when precision is the most important factor. Stationary CMM’s (coordinate measurement machine), portable CMM arms, and the FARO Laser Tracker are all examples of digitizers that we often use at Direct Dimensions. Other methods of collecting 3D data include white light scanning, CT scanning and photo image based systems. These technologies are being utilized more frequently in the field of 3D scanning and new applications are being discovered every day. 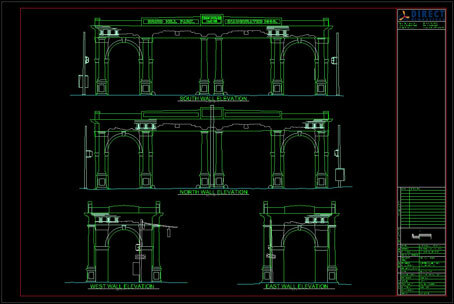 To be digitized or laser scanned? A general “rule” is that scanning is better for organic shapes and digitizing is most accurate for geometric shapes. In general, laser scanning is also used for higher-volume work (larger objects like cars, planes, and buildings). Laser scanning is also a great option for people who need 3D data of an object but would prefer that the object not be touched, such as for documentation of important artifacts. Digitizing is often used for our engineering projects and first article inspections, in instances where precise measurements are required for geometrically-shaped subjects. 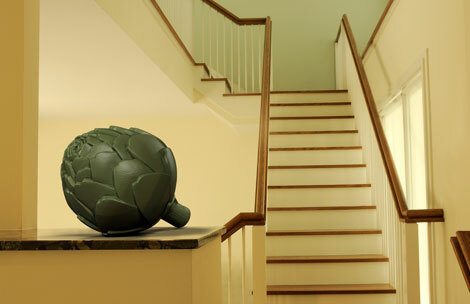 This includes objects that have defined lines and planes and curved shapes, like spheres and cylinders. This doesn’t mean that you can never laser scan a part with many geometric features or that you can’t digitize a plane (an entire plane can be digitized, believe us - we’ve done it!) or even a sculpture. These are just rules of thumb. There are projects when it is more cost and time effective to use multiple methods of data collection. A good example is a cast part with geometric machined features. You might need a 3D model of the entire part but really need incredible accuracy on the machined features while the freeform cast surface itself is not as important. In such a case it can be much more effective to laser scan the entire part and then digitize the geometric features. The data can be combined during the modeling phase (more on that in the following chapters). Because you are trying to collect the most accurate data possible, there are a few more things to keep in mind before you run out and start scanning everything in sight. Very reflective materials generally do not scan well. This can be avoided with a light coating of white powder spray (or anything that dulls the reflectivity). There are also some scanner manufacturers who are actively working to solve this problem. Fixturing: whether you are laser scanning or digitizing, it important that your scan object will not move while you are collecting data. The tiniest motion will cause inaccurate data. If you need hard to reach/impossible to see internal data, you should consider CT scanning or destructive slicing, both can be great ways to augment your data. (more on those later). Now that you have a good idea of what you need to collect data, you are ready to learn all about the various ways the data can be modeled. Chapters three through five will cover, 3D Modeling, Reverse Engineering, and Inspection Analysis. What is a 3D model and how do you get it? A 3D model is a digital representation of a physical object. If you already have an object, and you want it in a digital form, that’s what we do. Direct Dimensions takes physical objects that you send to us and we use advanced 3D scanning equipment to capture and transform them into 3D digital models. We do this by processing the raw data gathered during a 3D scan into a digital model that can then be used by you for many purposes. In the next chapter, we'll cover the different methods for collecting this data, including laser scanning and digitizing. A 3D model is incredibly versatile. 3D models can be used for many purposes like making an animation or visualization. They can be used to make design changes to make a new product. They can be used to perform dimensional and comparative analysis of an object, or even FEA and CFD analysis. They can be used for archival purposes - to accurately record the state or form of an object. They can be used to digitally repair damage that has been done to an object which can then reproduce that object in its proper form using rapid prototyping and milling technologies. They can even record your face in intricate detail! (And yes, some of our lasers are eye-safe!). There are no limits as to what can be done once something has been captured in 3D. In short, our technologies allow almost any physical object to be recreated into a 3D digital format that can be used for just about anything you want. When? Where? How Large? What are the limitations? With our various technologies, we can capture objects indoors or outdoors, during the day or at night. The sky is the limit for how large and we also have technology that can capture even the smallest objects. Some of our equipment is portable so we can come to your facility, or you are encouraged to ship your items to our lab. On the large side, Direct Dimensions has successfully scanned entire airplanes, historic monuments, ships and subs, tracts of land, and large interior spaces like buildings. We’ve scanned mid-size objects like spacesuits, countless consumer products and art work. We've also done tiny, finely-detailed items like coins, medical devices, and dental appliances. We've even captured fingerprints and skin textures! The bottom line is that whatever your object, the tools exist to scan it, and its likely we use them. Now that you know the basics of what can be scanned and how 3D data can be used, you are ready to learn more about the different methods we use for data collection!